I’m not a transportation planner. It’s hard work, complicated – and a surefire way to have people question your ideas. But, like any citizen who pays attention, I have some ideas. Boise’s city leaders have been working on a streetcar idea for nearly a decade. The response from citizens has been, for the most part, tepid. But the idea remains. In my long piece on the streetcar late last year, the mayor’s spokesperson made a point that has stuck with me. I lived in Seattle for just long enough to understand what traffic is. Sitting, not moving, wishing-you-had-a-bathroom-in-your-car traffic. Boise, of course, doesn’t really have much traffic. Sure, the Interstate chokes up with accidents and can be slow in the average commute. Front Street through downtown is a slow, cloggy mess many evenings. Leaving a Boise State game can be slow. On the whole, however – it’s pretty easy to get around. But what about in 2040? Downtown isn’t really a problem child for traffic. You can pretty easily jaywalk any of the streets most of the day and evening (not that anyone I know does that). The streetcar is expensive. Really, really expensive. After my story was published, a local elected official told me off the record that it would “never happen,” and dismissed the project as folly. As I talked with Journee and streetcar project manager Jim Pardy, I told them they lay out a convincing case. And for the most part, they do. But it’s very hard to get past the cost, and the relative lack of need for a train that goes in a fairly walkable circle. 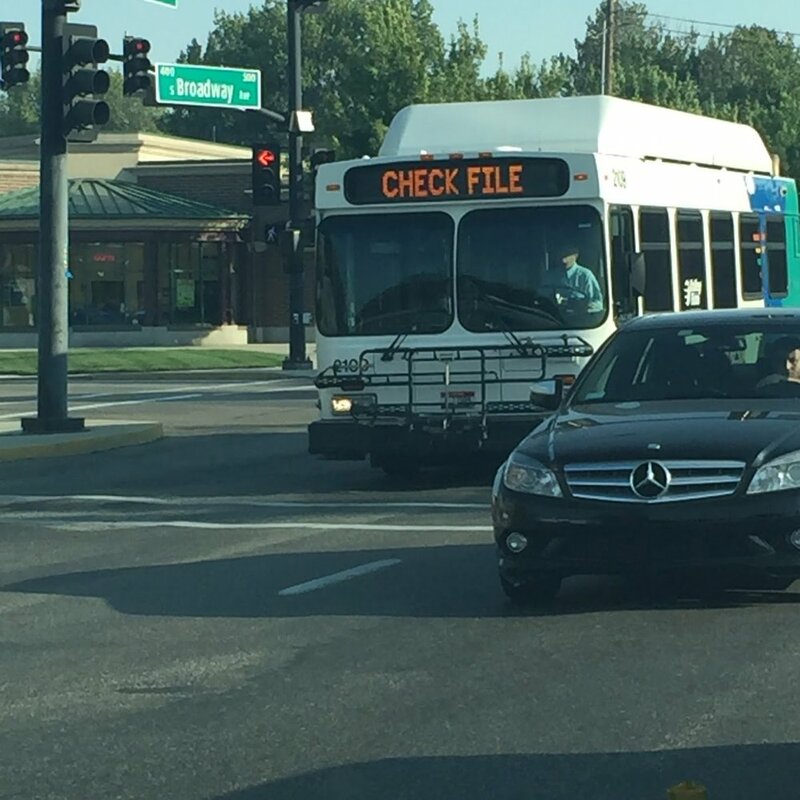 Boise’s buses, on the other hand, currently are underused. They don’t run on Sundays, holidays, or even very late into the evening. The streetcar would run more frequently if built, but it would be a strong link in a weak bus system. If I live anywhere but downtown and don’t own a car, I’m going to be stuck without an option other than my own two feet and their ability to walk or peddle a bike. COMPASS even somewhat-confusingly touted a stat that points out the problem: 80% of Treasure Valley residents aren’t within walking distance of a bus. I asked the City of Boise pair why a streetcar and not the “Micron to Caldwell” rail line. Twenty years ago, then-mayor Brent Coles spearheaded a trial of a train from Micron to Caldwell on those existing Union Pacific tracks. Temporary stations were set up, and people could ride the rails to commute. Why not do this now? Start here and connect from it. The Boise Depot is the historic icon of transit in SW Idaho – and it still stands in a pivotal position. Use the existing Union Pacific tracks (GREEN) to run commuter trains between the Boise Factory Outlet area near Micron and Caldwell. Some additional infrastructure would be needed – stops, park-and-ride lots and the like. You could have stops at the Boise Towne Square, a few blocks from Saint Alphonsus, near St Luke’s Meridian, Downtown Meridian, the Idaho Center, Downtown Nampa and Downtown Caldwell. And of course the Boise Depot. The existing UP track run right through the backyard of many of our area’s biggest hubs. Build a streetcar or bus circulator between the Boise Depot and the Idaho Statehouse (RED). It would pass by Boise State, the new multi-modal transit center, city hall, City Center Plaza and within a few easy walking blocks of Simplot, JUMP, Zions Bank and dozens of other buildings. It would give the city the downtown catalyst project and accomplish most of the streetcar project, but would be knitted into a larger system. Existing talks are underway to do something along State Street. Maybe those talks should produce a high-frequency bus route that comes around every 10-15 minutes and goes from the end of that new streetcar line at the Idaho Statehouse, out to Eagle Rd. and meets back up with the UP tracks near St. Luke’s Meridian (BLUE). 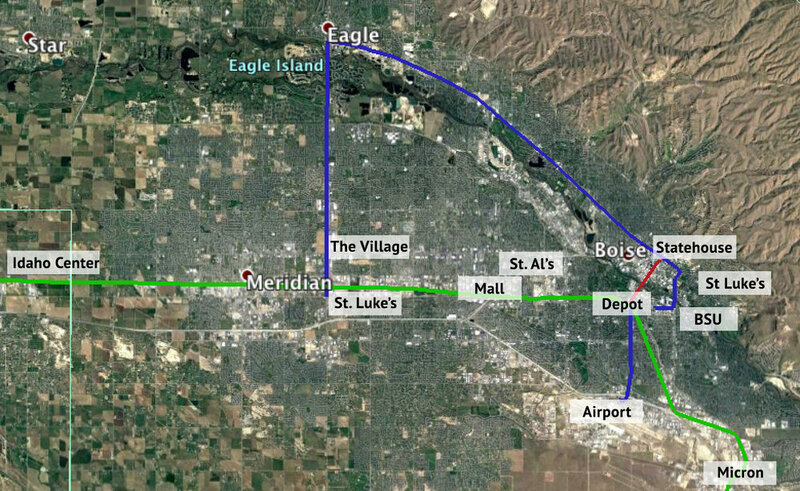 The route could also go east from the Statehouse and zip by St. Luke’s Boise, up Broadway by Albertsons Stadium and connect to the transit center at Boise State. Take that same idea and connect a high-frequency bus route from the Boise Airport to the Boise Depot. With a fleet of buses, passenger trains, and vision – you could put together a dynamic, thriving system that connects nearly every big thing in the valley. The hospitals, the arenas, the major employers, the mall, the Village at Meridian, the airport and more. Bring it all together under a common, smart brand and you have a uniting concept. As I reported in my streetcar deep dive, Bieter said choosing a rail-focused system over buses came down to one thing. Pardy likened the streetcar to a loved Boise treasure. “At one point someone had the vision to build the Greenbelt,” he said. The mayor has his vision, and he has every right to work on it as he sees fit – he’s been elected to his spot three times, and we live in a representative democracy. But maybe a different vision could make sense. The great thing about the Boise River Greenbelt example is that it runs from Lucky Peak to beyond Eagle – and is a source of pride for everyone regardless of which city they call home. Any transit system should have a similar Big Idea with an eye on 2040 – and serve as many people as possible.